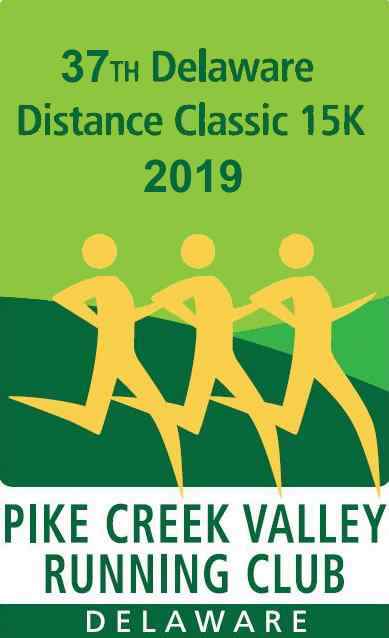 Pike Creek Valley Running Club put on its signature race on Sunday, the Delaware Distance Classic 15K, beginning at Frawley Stadium on the Christiana Riverfront in Wilmington. Blessed with an morning temperature in the mid-forties, a light breeze, and sunny skies, none of the 268 finishers had to endure temperatures above 60 degrees before the race’s end. With race registration over 290, the event had its best attendance since 2004. The weather helped participants runs some fast times. Joe Dare (49:49), Mark Vilardo (50:07) and Matthew Sandercock (50:55) were the top three men’s finsihers. Sandercock was also the first male master with former Distance Classic winner and masters runner Greg Watson (51:40) having to settle for a fourth place as 1st male 40-44. Female winner Molly Pritz, 21, of Williamsport, PA. was fifth overall. Her time of 51:46 was only 22 seconds off of the all-time female state record set by Wilma Vanonna in 1992 when world class runners were offered bonus money for meeting certain time standards in addition to the regular prize money. Masters women Doureen McCoubrie (58:07) and Julie Hankin (1:01:16) were second and third finishers with McCoubrie also collecting the first master award. Notable among the finishers was former Olympian Vic Zwolak, who continued his assault on the 70-74 age group state records. 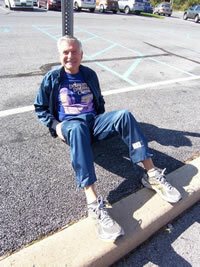 His time of 1:08:52 bested the time of club member Don Monagle by several minutes. This is now the third age-group in which Vic hold the 15K state record. With this race being held in Delaware, where everyone is only one or two steps removed from knowing everyone else, the race was attended by Delaware Attorney General and possible U.S. Senate candidate Beau Biden (1:04:50) and Hallie Biden (1:10:06, 2nd 35-39). Many runners might like to know the secret of maintaining the fitness to run under a seven mile/mile pace since AG Biden spent the last year on a tour of duty in the Green Zone in Baghdad, Iraq. 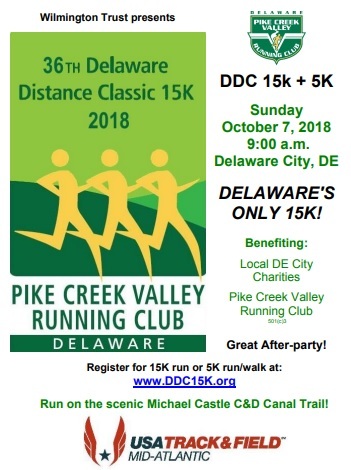 The Delaware Distance Classic 15K was designated the state championship event for the distance by Mid-Atlantic USA Track and Field and Pike Creek Valley Running Club proudly displayed the banner which proclaimed that. 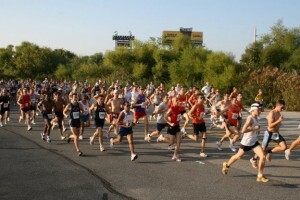 Many of the runners came from the various running clubs which participate in the MA-USATF race series. The 26th running of the Delaware Distance Classic 15K brought a much better day than last year when temperatures soared in the eighties. Although the temperature warmed as the race progressed, it wasn’t too warm. 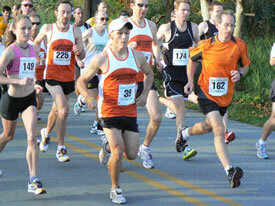 The great weather helped bring an increased turnout, with 267 registered and 248 finishers. 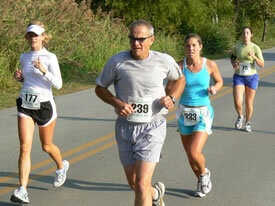 The number of finishers increased by 67 over last year. The male winners of the race all had a running store connection as Mike Monagle, 39, owner of Delaware Running company, won in a time of 52:01, taking the lead at six and a half miles and running just hard enough to outdistance his employee, Joe Switzer, who ran 52:20. Scott Purcell, one of the owners of the Chester County Running store, came in third in 52:48. The female winners were Maureen Ackerly, 39, of Richmond, VA, who ran 56:44. 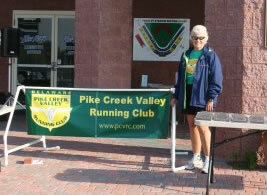 Second was Denise Dahlhoff of Philadelphia, PA, with 1:00:42 and third was Ann Tripp of Fredricksburg, VA in 1:01:17. 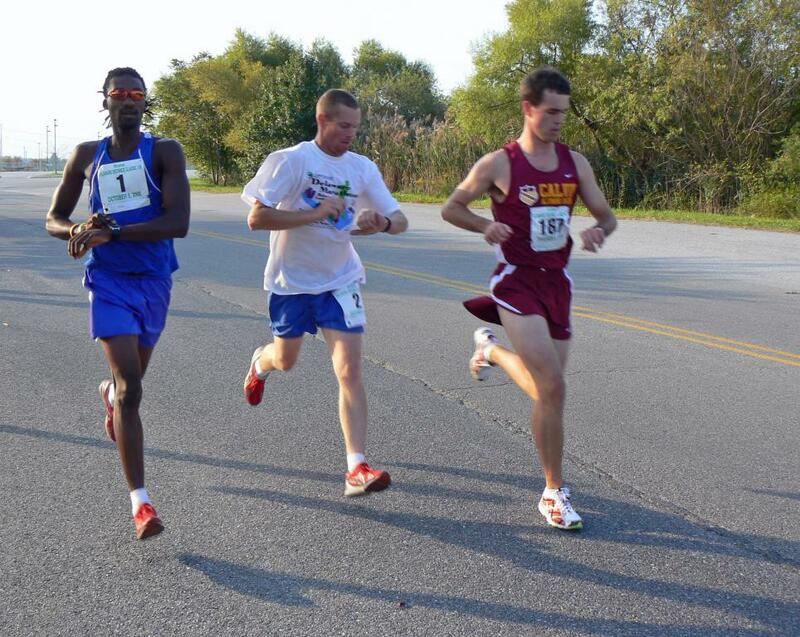 Joining the PCVRC and MA-USATF on Sunday was Enos Benbow of Georgetown who came in 4th overall in 53:05. Club members Josh Loren and Andrew Jakubowitch were 5th and 7th overall. Christina McDermott was the first Delaware female finisher in 1:04:30. Ten year-old Kitty Onwenga of Middletown may have been the youngest person ever to complete the DDC, in 2:03:02. Certainly her companion finisher, Lillian Njogu, 14, who was one second behind Kitty, has the unique distinction of being the first person to run the entire distance barefooted. Jules Woodall and Alexis Andrianopoulos received running logs for being the two mid-pack runners, the two finishers halfway between first and last. The race this year was dedicated to local triathlete Mike Clark, who passed away this past year. A check in his memory will be presented to the Boys and Girls Clubs, for which Mike gave a lot of his time. PCVRC president Jerry Herman extends his thanks to the many club volunteers who gave their time to make the event possible: Dave Farren, who has now been race director for ten straight years; Kathy Farren; Rudy Antonini; Grif Balthis; Rachel Bleacher; Chip and Doris Bixler; Ron Bock; Jim & Kay Durkin; Austin Gee; Tom Jermyn; Mark Lozier; Carolyn & Dave McCorquodale; Paul Nemeth; Karin Pszczola; and Joel Schiller. Non-club member volunteers were Dan Farren, Michelle Ferrell, Mark Koenig, Sue Simmons, and volunteers with first names of Bill L., Bill S., Cajun Mike, Ginny, Ted and Ted Jr. Barbara Kursh helped a sleep-deprived Wayne Kursh, who had flown in from Ireland, with the timing — AND she ran the race. Former club member Doug White quickly remeasured the course the day before to account for a road closure which required a detour. I will add that Jerry Herman and Kim Riccio were there from six in the morning until the finish of the race, helping with myriad details. 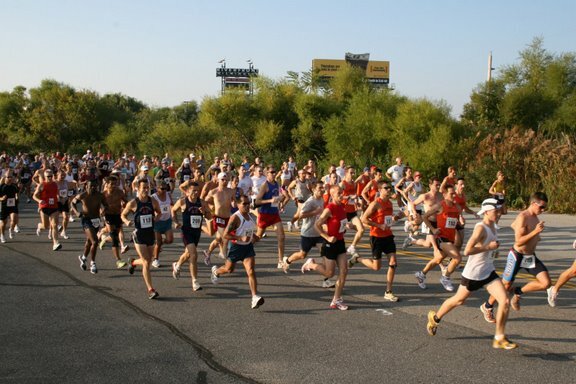 2007 Race Recap: Hot & Humid! Pike Creek Valley Running Club held its 25th annual Delaware Distance Classic 15K at Frawley Stadium on the Christiana Riverfront in Wilmington. Despite the continuing construction creating route changes and small conflicts with motor traffic, the race went well with only minor glitches noticed by the race director and no complaints from the participants. At least no complaints about the race direction! There were certainly complaints about the weather, which approached eighty degrees by the end of the race. Even with the change in running date(with the second to first Sunday in October), registration was only down slightly with a total of 210 who registered. However, with about 200 actually towing the starting line, about 10% of the field could not complete the course, with 181 actually finishing. With the air temperature being in the upper 60s at the start, it felt cool enough for most runners to take off at their normal paces. But, unfortunately, the dewpoint was almost the same as the temperature, meaning that people heated up within a few miles and started to slow the pace or even overheat and stop. Fortunately no one required medical attention. In the results, the men’s race was won by Jake Krong of Elkton, Md. 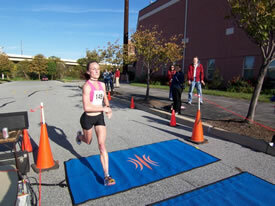 in 52:22 and the women’s races was won by Lydia Singer of Claymont, De. in 59:31. Master’s winners were Chuck Shields, 54:15 and Julie Hankin, 1:02:41. Julie was also second overall female.